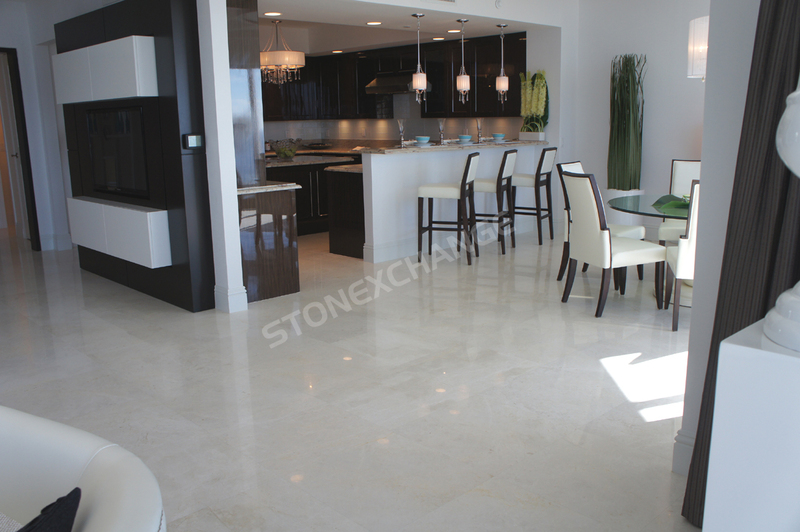 When working on a renovation project with a contemporary feel, Vanilla Oro marble can help you create the right look. You can create countless patterns with this marble in the foyer, bathroom and other larger areas, but you may find that you get the most impact by using marble in unexpected areas. In addition to using marble on your floors, as a backsplash in the kitchen and on counters, here are a few ways you can use the marble to complete your contemporary look and take the design of your Miami home to a higher level. Stairs are one of the hardest areas to finish because they see the most traffic. You want materials that can withstand the regular foot traffic and still look great. In addition, you also need to choose products that will resist stains and look great for years to come. While carpet is commonly used, marble gives you the added benefit of turning your stairs into more of a focal point. The solid surface is resistant to stains so it will be easy to clean. The stone is also durable enough to handle being kicked when it’s installed on the risers. You can put different patterns on the stairs to make them stand out, or go with a monochromatic look to help the stairs blend and keep the entire area looking sharp. There are several materials that can be used on the window sills, but marble is one of the most durable options. It looks amazing and won’t be harmed by a little moisture. Unlike other materials that will turn yellow in direct sunlight, marble will maintain its fantastic look and true white color. This makes it a natural choice for any builder who’s committed to paying attention to the little details. Using white marble in the window sills also makes decorating easier later because it goes with any color scheme or décor. This will look particularly attractive with a contemporary theme that focuses on clean lines and sharp color contrasts. Throughout the home, there may be places where a window needs a finishing touch, but you don’t want to cover it with curtains. This includes glass block windows in the bathroom and basement. Rather than reaching for simple wood trim, bump the entire look up a notch by going with marble. Custom cut into narrow strips, marble can become the perfect finishing border for windows in the bathroom, kitchen, or office. It’s easy to care for, and you can tie in the marble floor and other highlights by including it around the window. The modern trend for builders is to glue a frameless mirror on the wall and then walk away. However, you don’t have to settle for this simple solution. Another idea is to use marble strips to create a stunning, luxurious border around the bathroom mirror. The marble helps reflect light to make the mirror feel a little larger, and you’ll create a nice break between the colorful painted wall and your mirror. It’s an easy solution, and you can even have the marble custom cut in order to minimize the seams around your mirror. When working on a contemporary design, you want the entire area to flow visually for the greatest balance and visual appeal. A wood threshold in a sea of sleek modern materials can stand out and set the wrong tone. Likewise, a simple metal threshold can drag down the entire area by not living up the standards you’ve set in the rest of the living space. With marble, you can avoid these problems while installing a durable material that will last for years to come. Marble thresholds can be custom cut to fit any size doorway with the minimum number of seams, and the brilliant white color of Vanilla Oro will work beautifully with your contemporary design. You’ll also reduce maintenance requirements down the road while adding visual appeal to the entire area around the doorway. A trend that’s growing in popularity is to leave the wood at the lumberyard and go with marble baseboards. They last longer, look incredible and will never have to be painted. They’re the perfect choice for bathrooms and kitchens where you’re dealing with higher humidity levels and water. Choose tiles that are long and narrow to easily cover your baseboard area. They’re simply glued directly to the walls using mastic, and you won’t have to worry about ever replacing them. Use them in any room where marble is the flooring of choice. They’re also a natural choice for outdoor patio areas and kitchens that feature marble floors. A benefit of using this material in the kitchen is that the marble can withstand being used beneath cabinets where they’re more likely to be accidentally kicked and scraped. When you have a vertical surface that rises up into the room, consider using coordinating marble to make this blend in with the floor. Examples are bathtub surrounds, the ledge for shower stalls, and partial walls in the bathroom. You’ll effectively make the space look larger and create a visually appealing look that works with any décor. It’s more attractive than plastic surrounds, and the marble will also be easier to clean. Once you make the decision to use marble in your contemporary project, save money by going with a supplier that can give you wholesale pricing along with fantastic service. Contact Nalboor today to speak with one of our customer service representatives and place an order. If we don’t have the size or style that you need in stock, we’ll be happy to custom order it for you. Customer satisfaction is our number one priority, so you can rely on us to provide you with great service and courteous treatment. We maintain tight cost control while upholding our high quality standards, so you can expect to pay low prices without sacrificing anything on quality. Place your order today to have the tiles shipped to your office or business site, and see why so many people around the nation are trusting Nalboor to provide them with the natural stone supplies.